We dish about the best vacations we've ever had. Kelsey's top trips include exploring in Portugal and relaxing in Montana. Erica reminisces about the perfect trip to Maui. But then there are those vacations that don't go so well. 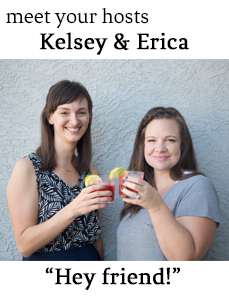 Kelsey shares about a disastrous Vegas vacation, and Erica recounts a fall weekend in Sedona complete with smoke inhalation. We talk about our fond memories from family summer vacations growing up, our own personal vacation bucket list destinations, and what it takes to make for a successful vacation with other couples. We also share the funny quirks or habits we only exhibit on vacation, and our personal packing styles. Erica is working on packing more like this. In current obsessions, Kelsey is crushing hard on her newly organized garage, and Erica has a new found love for greek yogurt with Chobani Flips. In neighborhood news, Erica has a run-in with an aforementioned political sign. Kelsey met a very congenial young man while walking Erica's dogs, is very pleased with the customer service of our municipality, and is feeling optimistic about a neighborhood bakery after some research.